Robert Marella may not have had the greatest wrestling career of all time, but no one can dispute that, over 40 years, Marella genuinely affected the course of professional wrestling, in his roles as a wrestler, commentator, manager, and president. Is it any surprise that Marella has been inducted into several Hall of Fames? Marella began amateur wrestling in high school, and went on to be a stand-out athlete at Ithaca College, using his great size to take him to second place in the 1959 NCAA Wrestling Championships. This brought Marella to the attention of Pedro Martinez, a professional wrestling promoter in New York, who signed Marella out of college. 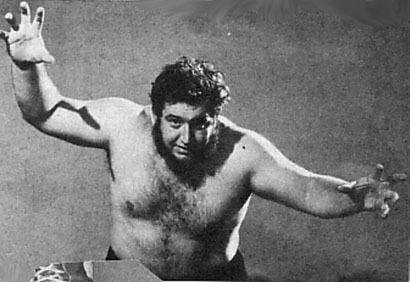 Marella first went under an Italian-American gimmick, calling himself Gino Marella. Although the gimmick didn't last, the first name stuck in the business (if you listen to certain WWF shows, you'll hear fellow broadcaster Jesse "The Body" Ventura call Monsoon "Gino"). Marella then went for a very different look, becoming the wildman known as Gorilla Monsoon, a dastardly heel from Manchuria who, with manager "Wild" Red Berry, quickly became one of the most hated wrestlers in the USA. Monsoon put his heart and soul into the gimmick, rarely speaking to fans and pretending to be a dangerous foe indeed. Gorilla Monsoon wrestled around the country with his gimmick, including signing on with Vince McMahon Sr's World Wide Wrestling Federation, which had withdrawn from the National Wrestling Association in 1963. Monsoon quickly struck gold, teaming with Killer Kowalski to win the WWWF United States Tag-Team Titles from Skull Murphy & Brute Bernard in November 1963. The two held the belts for over a month before falling to Chris & John Tolos. Monsoon wasn't done, though, as he soon switched partners, getting with Bill Watts to come back and reclaim the WWWF United States Tag Titles in April 1965, this time beating Gene Kiniski & Waldo von Erich. This time Monsoon had the belts for four months, before he & Watts lost to Dan & Bill Miller. Monsoon continued to be a force in the WWWF for the next few years, regularly battling one of the top babyfaces, Bruno Sammartino, in the main events. Monsoon and Sammartino had several 90-minute draws, to rave reviews from wrestling fans. Despite his best efforts, though, Monsoon was never able to get the WWWF Heavyweight Title around his waist. He did, however, win another prize, travelling to Sydney, Australia, to win the International Wrestling Alliance World Heavyweight Title in February 1968 from Spiros Arion. Of course, since Monsoon was only on a short tour, he dropped the belt back to Arion a month later, and returned to the United States. In 1969, Monsoon's career took a major turn, as he was attacked on television by another hated wrestler, the Sheik, with Sammartino, Monsoon's long-time foe, surprisingly coming to his aid. Monsoon quickly became a babyface wrestler, fighting with Sammartino against the Sheik and other heels in the business, including the heel WWWF Champion, "Superstar" Billy Graham. Due to his size, Monsoon rarely carried any gold during this time, with the thought being that he didn't need to be a champion to be thought of as a draw. Monsoon did have a major career moment in 1976, when he had a confrontation with boxing legend Muhammad Ali. Ali was currently preparing for a match against Japanese wrestler Antonio Inoki, and decided to confront Monsoon in the ring. In a moment that still inspires discussion on the realism of the event, Monsoon picked up Ali and locked him in the Airplane Spin, before dropping him to the mat. In 1977, Monsoon joined other WWWF wrestlers in travelling to Puerto Rico to wrestle in the World Wrestling Council. In July 1977, Monsoon defeated Hartford Love for the WWC North American Heavyweight Title. Monsoon, while also returning to the states, regularly defended the title, until he lost it in May 1978 to his friend/rival, Sammartino. Monsoon got the better of Sammartino a few months later, regaining the title, and would have another long run as champion. Finally, in March 1979, Monsoon dropped the belt to Carlos Colon, ending his long run with the gold. Moving into the new decade, Monsoon began to feel the effects of a long wrestling career. In 1980, Monsoon fought Ken Patera for Patera's WWF Intercontinental Heavyweight Title, saying that he would retire if he lost. When the match had to be stopped due to Monsoon being cut open, Monsoon stayed true to his word, later announcing his retirement from the sport (although he would appear sporadically in special matches for the next few years). During this time, Vincent McMahon's son, Vincent Kennedy McMahon, was taking over the business of the World Wrestling Federation (WWF). McMahon approached Monsoon and bought Monsoon's stock in the WWF (Monsoon had a percentage from Vincent Sr), in exchange for giving Monsoon lifetime employment with the company. Monsoon was soon paired with another retired wrestler, Jesse "The Body" Ventura, as the commentators for WWF programming, with Monsoon also working in the backstage area. Monsoon would later join with Bobby "The Brain" Heenan, forming another famous broadcasting duo. With Monsoon's help, the WWF quickly became the major force in professional wrestling throughout the 1980's. Monsoon left the announcer position in 1994, giving the position over to another future announcing legend, "JR" Jim Ross. Monsoon had his own difficulties at the time, as his son, Joey Marella (who had been a WWF referee), fell asleep while driving after a WWF event, crashing his car and later passing away. Monsoon would disappear from the limelight for a time, but would make a dramatic reappearance in 1995, as he replaced Jack Tunney as the on-air President of the WWF! 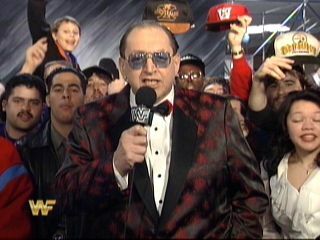 Over the next two years, Monsoon would make several critical decisions for the WWF, working as a "face" president interested in only helping the fans. In September 1995, Monsoon made the decision to allow Davey Boy Smith to replace a late Owen Hart, in Hart & Yokozuna's Tag-Team Title defense against Shawn Michaels & Diesel (Kevin Nash). When Hart arrived and was subsequently pinned, Monsoon was forced to take the belts away from Michaels & Diesel (since Hart wasn't the legal man), but quickly got Hart & Yokozuna to defend the belts the next night, where they lost them to Smoking Gunns. In January 1996, Monsoon opted to suspend a rampaging Vader, which earned Monsoon Vader's wrath. Monsoon was Vader-Bombed, taking a horrible bump. He would quickly recover, though, continuing on as the President of the WWF for the next year. However, in 1997, Monsoon was forced to give up the Presidency due to health concerns, working instead as a road agent for the WWF. His health grew worse and worse over the next two years, but Monsoon continued to work for the company. His last appearance on-air was at Wrestlemania XV in 1999, as one of the judges for the Brawl For It All Match between Bart Gunn and Butterbean. The massive reception from the fans when Monsoon was announced was truly heart-warming. On October 6th, 1999, Robert Marella passed away from heart failure at the age of 62. His skills, both inside and outside of the ring, will never be forgotten. - JWA 5th Annual World League (March/May '63) = Monsoon competed in the league, which was won by Rikidozen. - WWWF Showdown at Shea '72 (September 30, '72) = Monsoon defeated Ernie Ladd. - WWC 10th Anniversary Show (September 17, '83) = Monsoon lost to Abdullah Tomba.